In Paris 13th, or worldwide by telephone, video conference or email. Smoking and Minor Addictions (cannabis, tea, coffee, chocolate). After my training in medicine (Oxford and Cambridge) and residencies in London and at the American Hospital of Paris, I trained in psychiatry (St Anne’s Hospital) and psychoanalysis (Ecole Freudienne) in Paris. I have been working as a psychoanalyst, psychiatrist and psychotherapist in the 13th arrondissement of Paris for the last twenty five years. For many years I was a consultant psychiatrist at Saint Anne's Hospital in Paris. For the last ten years I have worked as a specialised psychotherapist and psychologist. My subjects of interest are bulimia, anorexia and obesity on the one hand and the minor addictions of cannabis, tea, coffee and chocolate on the other. My office is in the 13th arrondissement of Paris, but I also work by video conference and email. Currently, I have patients in America, Switzerland, India and England, in addition to my patients in Paris. We psychologists and psychotherapists have to repair the disorders or breakdowns of the personality: lack of confidence, inhibitions, depression, anxiety attacks, school problems, sexual difficulties… These breakdowns can be small or devastating. But the good news is that they can nearly always be repaired. If you were functioning before, you can be put together again, as good as before and sometimes even better than before. In addition to my general psychological work, for the last 20 years I have specialised in the treatment of bulimia and smoking. (Bulimia is closely related to anorexia and similar mechanisms are at play in obesity. Similarly, smoking is related to some of the other minor addictions such as to cannabis, tea, coffee and chocolate). My thesis is that both these conditions, of eating and smoking, are first of all psychological disorders. To stop overeating and smoking the patient has to first make an inner psychological change. The primary lesion is in the unconscious psychology (software) of the subject and not in the neurochemistry (hardware) of the brain. In both these conditions, there is an initial psychological dissatisfaction, an incompleteness, a weakness that is lodged inside the subject. This lack expresses itself from time to time as the need for food or a cigarette. There is a psychological disturbance that “gnaws at you” from inside, which is at the origin of the need to eat or smoke. And so, logically, this psychological dissatisfaction can be filled by a psychological treatment. Drugs play no useful role. Please see in the relevant sections of this website a summary of my thoughts on these two subjects and the mechanisms at play. The eating disorders ( anorexia nervosa, bulimia nervosa and the atypical eating disorders including binge eating disorder) affect mostly the female population and are thought to involve approximately 3% of women aged between 16-35 years in Western countries. Many of these women are involved in a battle with themselves to be slim. These disorders are especially common in certain professions - actresses, dancers, models, gymnasts, jockeys... who need to keep their weight down professionally. They are constantly on a diet, using their will power, which breaks down. They then binge, vomit and then start again. They are caught in a viscous circle. When there is no serious underlying psychological problem, with help, they can be fairly quickly cured. But unfortunately it is not always so simple and there is often a deeper psychological problem, including this urge to be slim. A young girl who starts a diet can sink into anorexia. It is important to treat this quickly because this is a serious disorder. The same with bulimia. Early bulimia in a young person is more easily treated. Longstanding bulimia with vomiting takes longer to treat, because the symptom becomes a habit, an automatic behaviour, like cigarette smoking. But both these conditions are reversible, with some psychological work with a competent therapist. If you are a smoker who wants to stop, I can help you too. You do not need drugs or willpower but you would have to do this psychological work on yourself over a few months. This work on yourself is called the “talking cure”, which all therapists (psychiatrists, psychoanalysts, psychologists, psychotherapists) use in some form. Psychoanalysts have a special version of this method, first invented by Freud (free association). My research has led me to develop an improvement on this method, which you can call the “writing cure”. I write down word for word what the patient says and we read out this text before each new session. It is a prolongation of the talking cure. The rationale is that writing the patient's discourse and reading it out, erases the faulty text inside the patient's mind more completely than the talking cure alone. Take a look on this website. I am having considerable success in patients who continue treatment for a few months. I am participating in research with my psychiatrist and psychologist colleagues on these subjects, in the eating disorder and smoking cessation departments of some hospitals in Paris and Oxford. I hope to publish my own results soon. I am a private doctor (non conventionné) in the French system. If you have insurance (a mutuelle) and French Social Security, the treatment is not expensive. The first interview is free. It may be time to make that phone call or write that email you have been putting off for so long! Wherever you are in the world. 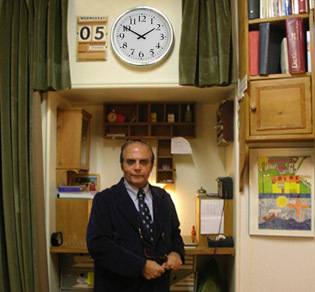 Dr. Harbans Nagpal, psychoanalyst and psychotherapist, is based in the 13th arrondissement of Paris. Medical degree from Oxford and Cambridge. Since 1990: Psychoanalyst and psychotherapist specialized in the treatment of bulimia and smoking. Bulimia with or without vomiting, with or without weight gain. Chronic obesity, overeating, snacking, night eating. Psychological support during a weight loss program. All the above-mentioned disorders are primarily psychological problems, and thus treatable psychologically. To stop smoking or eating too much, the patient must first make an internal psychological change. Medication, common sense advice and psychological pressure are not effective. The primary lesion is in the unconscious psychology (software) of the subject and not in the neurochemistry (hardware) of the brain. In both groups of diseases, overeating and smoking, there is an inner lack, a psychological frustration, which expresses itself as an uncontrollable urge to eat or smoke. There is in both these cases, a psychological weakness in the structure of the subject, related to food and maternal love. There are some hidden and unresolved issues inside the subject. These original defects, under certain internal and external conditions, gives rise to the hunger of bulimia and the craving for a cigarette in the smoker. These defects (the unconscious unresolved issues) are not spontaneously available to the subject himself, but are repairable psychologically by doing some work and with the help of an expert. The method: the "talking cure"
After taking stock of the situation and some common sense measures (for example of eating regularly and not trying to restrict your diet, of keeping a food diary and a weight graph etc. ), we have to attack the psychological problem at root, of where the craving is coming from. You are invited to talk about whatever you want, in free association. After the ups and downs of everyday life, very quickly the conversation comes to mom, dad, siblings, weight and figure, childhood... and the need for affection, encouragement, appreciation. These psychological needs have to be satisfied, not by the love of the therapist for the patient or common sense advice, but by an internal change in the psychological machine. How? By deleting certain words and rewriting others in the psychological software of the subject, the words that are missing, and are giving rise to the craving (for food, or cigarettes, cannabis, tea, coffee etc). This is the delicate work of the therapist. To better target the problem and to go faster to the heart of the matter, I have adapted the talking cure into a "writing cure", the cure through writing. I write verbatim, quickly, in pencil, the patient's discourse. At the next session we re-read the text before moving forward. Thus, the patient hears what he said, he gets distance on himself, he must choose his words. This method helps to better erase bad memories and allows us to write a new story in their place. It also allows us to work remotely, via email and letters. How long will it take? Is there a guarantee? This is not a magic cure. You must co-operate and do this work for some time. You will feel a slight but significant improvement after each session. If you are not convinced after a short period of collaboration, you can stop. Each case is different, but fairly quickly, usually within 2-6 months, without any effort of will power, you will be able to reduce your food intake or your cigarettes. In a few more months most people can be cured entirely. Some recent symptoms (snacking, tea or coffee, chocolate...) can be more quickly cured, in 1-2 months. Long standing, chronic problems may take a little longer. The price of a consultation is between 75€ and 125€. The first appointment is free. If you have a good insurance (mutuelle) you can be fully refunded.